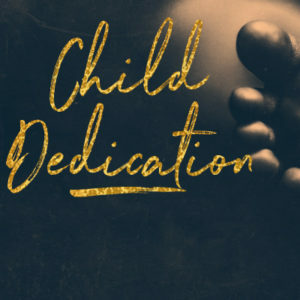 What is Child Dedication all about? We, as Christians, have a tremendous responsibility given to us when the Lord blesses us with a child. By doing so, He entrusts us with the responsibility of raising that child in the way of the Lord and establishing early in his life, a foundation built upon Jesus Christ. It is this tremendous responsibility that causes us to think of baby dedications as “family dedications.” We feel that the whole family needs to be lifted up to the Lord so that each member will be able to keep his or her responsibilities. God honored Hanna’s request and gave her a son named Samuel. Hannah then, in keeping her vow, dedicated (or set apart) Samuel unto the Lord. We see here a beautiful example of what our attitudes should be towards our children and their relationship to God. We are to do the most we can to “set apart” our children to God until the day that they can make their own choice. By dedicating your children to the Lord, you are making a vow to raise them in His ways. The following is a list (though not exhaustive); of some of the things parents do as part of keeping their vows. The main reason for the state of blessing, for this man’s children, is that they have someone to look up to and to use as an example to model their own behavior. We need to be the spiritual heroes of our children. Therefore, we as parents are encouraged to strive to be that example to our children even as Christ is our example. We are taught in Ephesians 6:4 (NIV) to “bring them (your children) up in training and instruction of the Lord.” And Proverbs 22:6 adds, “Train a child in the way he should go, and when he is old, he will not turn from it.” If we, while our children are young, instruct them in His ways, our children will grow in the ways of God for a lifetime. A parent’s responsibility to pray for their child does not end at their dedication, but continues throughout the rest of their life. And in James 5:16…“The prayer of a righteous man is powerful and effective.” The prayer of Christ centered parents powerfully covers their children in prayer that will produce effective change for a lifetime. The dedication of your family is a serious matter. It is hoped that this paper has helped you recognize the extent of this commitment that you will be making. If you have any questions concerning anything that has been said, or not covered here, please call the church office and make an appointment to speak to one of our Pastors at (863) 422-4488.